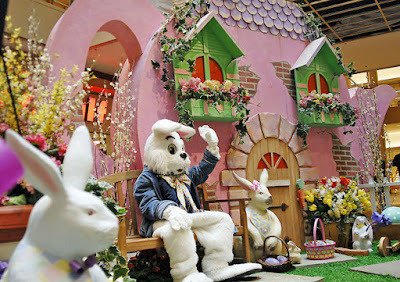 Buzz Kill Ramblings of Tim Louie: A BRAWL AT THE MALL.....WITH THE EASTER BUNNY? With Easter coming this Sunday, I felt this story was more than appropriate for today's blog, and go figure, it happened at the Newport Center Mall in Jersey City, NJ, my old stomping grounds. I used to work upstairs from this mall when I worked at dance station WKTU. Anyway, the spirit of Easter came to a screaming halt Sunday evening after a mall bunny found himself tangled up in a brawl at the mall. In a video posted on Twitter from Newport Center Mall, an Easter bunny was seen exchanging punches with a customer waiting online to have photos taken. At the beginning of the video, the bunny, without his floppy eared mask on, is seen being separated from a man wearing a brown shirt, but seconds after they are taken away from one another, the bunny throws his gloves off and approaches the man again. No word on what caused the incident as police could not be reached for comment, but come on people! It's Easter! Can't we all get along? Besides, how low can you be to pick a fight with a fluffy white-tailed bunny taking photos with your kids? What would have made this video even more hilarious is if Santa Claus came out of nowhere to save the Easter Bunny from being pummeled. I was also wondering, how the hell do you fight in that costume? This feet would have made me trip all over the place. That would have a been a bad situation all-around! Only in Jersey!